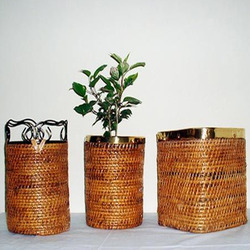 We are one of the leading providers of a superior quality range of Round Willow Planter Basket. A type of jali known as 3sw jali used for multiple items . It is unique designs and is used for particular gift item. We provide an innovative & wide range of kashmiri baskets which are made from fine quality raw material. These are available in various shapes, sizes. Available in a variety these basket can be custom designed, manufactured & supplied as per client specifications. We offer Bamboo Willow Square Basket to our clients. Owing to our proficiency in this domain, we are providing our clients an optimum range of Wicker Basket. These baskets are made with natural, not treated, willow shoot. 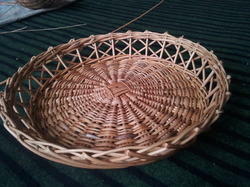 Willow Basket is available at various sizes reasonable rates. Simple and durable as it looks comes in sizes. 3 pieces per set, sizes of which are : 10", 11" 12"
For any further details, please contact Exoticaa Handicrafts.